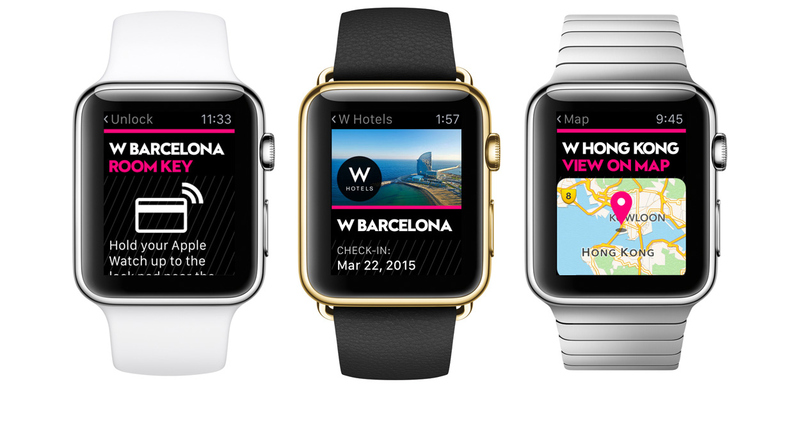 The SPG app for Apple Watch provides the industry-first ability to unlock a guest’s hotel door right from their wrist through SPG Keyless, our new mobile check-in functionality available at over 150 W, Aloft and Element hotels worldwide. 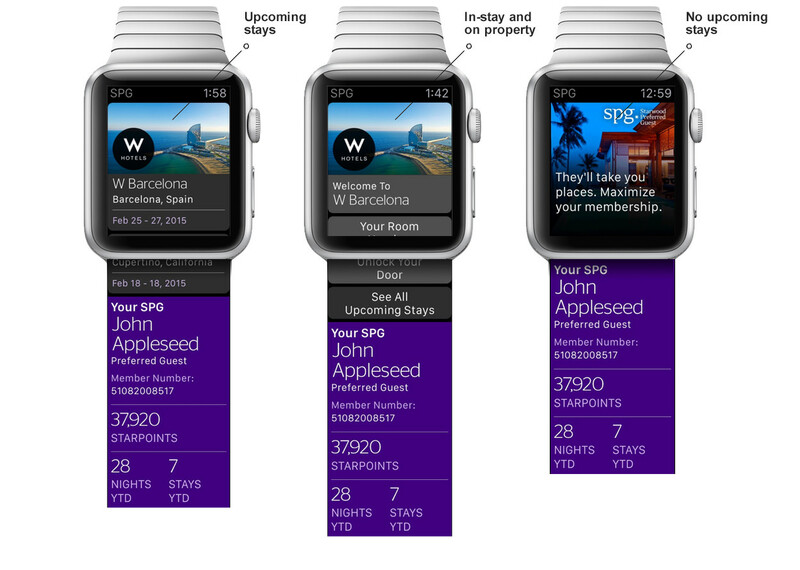 The SPG app for Apple Watch provides the industry-first ability to unlock a guest’s hotel door right from their wrist through SPG Keyless, our new mobile check-in functionality available at over 150 W, Aloft and Element hotels worldwide. The app also creates an unparalleled experience at our 1,200+ hotels by providing the important information guests need right when they need it like the address of the hotel in the local language, transportation options, directions, and SPG account updates. It will even remind them of the most commonly forgotten thing when traveling – their room number. Unlike other mobile apps for smart phone and tablets, wearable experiences need to be designed to distill and curate information for the user who os focused on using the form factor to help them accomplish something in the moment. 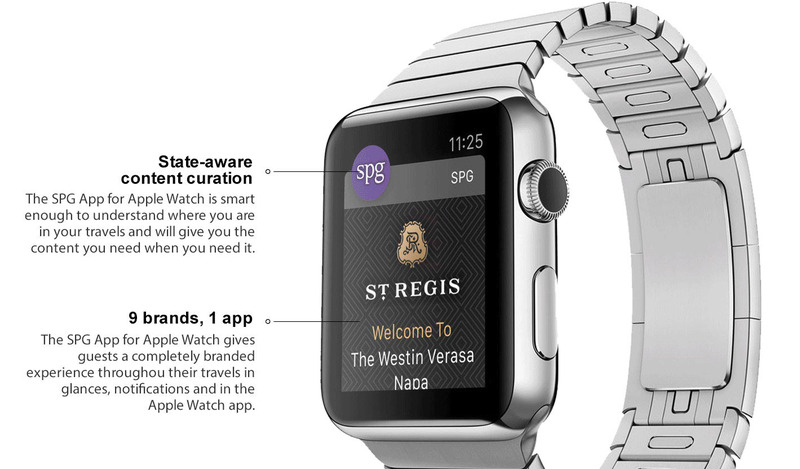 The SPG App for Apple Watch continues the pioneering concept of state-aware design to give guests the information and functionality they need before, during and after they stay at a Starwood hotel through glances, notifications and the Watch app. SPG Keyless represents a groundbreaking turning point in the traditional hotel experience by fundamentally redefining the way guests arrive and check in to their rooms. SPG Keyless – powered by the SPG app – enables guests to bypass the front desk, avoid waiting in line and ultimately unlock their stay with a simple tap of their smart phone. This innovation frees up hotel associates time, allowing them to engage with guests and transform the first interaction from transactional to personal. It’s high-tech supporting high-touch unlike ever before. Starwood tapped the world’s largest lock manufacturer, Assa Abloy, to create an all-new, Bluetooth-enabled lock as well as keyless software, which are designed to securely recognize and connect with a guest’s mobile device. Learn more about SPG Keyless here. The home screen of the SPG App for Apple Watch has four different states based on where the user is in their stay cycle with SPG. The first state is simply a display that tells the guest they must log in to their SPG account to use the app on Apple Watch. This was done because we found that generic interactions on property were not compelling and interactions like searching for a hotel or booking a room were too cumbersome to make sense of a device like this. Once the user is logged in but if they have no upcoming stays the home screen will display messaging customized to their SPG tea and show them their current SPG account information. If the user has upcoming stays then the home screen will display those stays which they can then use as a jumping off point to the property pages where they can find out more about the hotels. When the user is staying at Starwood property then the home screen will customize itself with shortcuts that will allow the user to easy get their room number, unlock their door and access all information they need for the hotel. 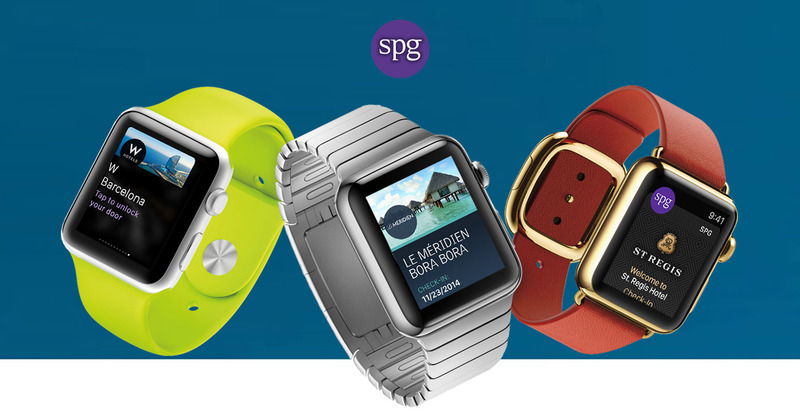 The SPG App for Apple Watch really comes to life when the guest arrives at one of Starwood’s 1,200+ properties around the world. Every part of the app from glances, notifications, the home screen and property pages will all transform to help curate and present the information the guest needs when they need it. The home screen provides shortcuts to the most used functionality while the property pages have a host of important information the guest will need from how to contact the hotel to how much a taxi should cost to get you from the airport top the hotel. The SPG App for Apple Watch was one of only 6 hero apps to be prominently featured on Apple.com. The app had its own stand alone module in the Apple Watch section of the site and was also part of the shopping process where customers could see what apps, including the SPG App for Apple Watch, would look like on the watch they were thinking of purchasing. 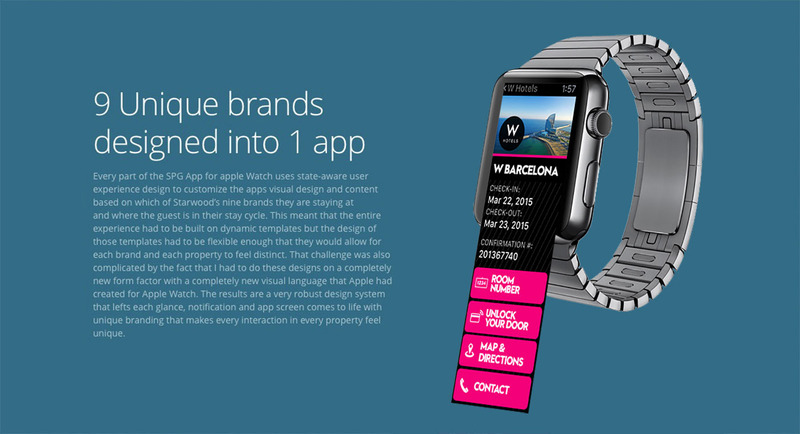 Once the Watch had launched the app was featured multiple places in the iTunes App Store including a main promo placement, topping the list of recommended apps in the Travel section and on the home page of the App Store. The design work for the SPG App for Apple Watch was also included in Apple’s Watch Human Interface Guidelines which are the definitive guidelines for designing for the platform.